The Uman Emergency Clinic is in its tenth year of operation under the administration of Nachman Klein & Avigdor Landesman, the directors of United Hatzola Galilee. The clinic was founded at the urging of HaRav Elazar Mordechai Kenig, shlita, leader of the Breslev Community of Tsfat. 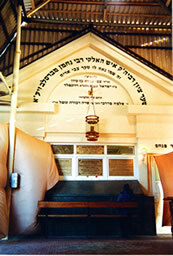 The Uman Emergency Clinic is centrally located in the courtyard of the Kloyz, 2 minutes from the gravesite. The clinic will be open 24/7 beginning Sept. 22, the Monday before Rosh HaShanah until Sept. 30, the Tuesday after the holiday. Last year, over 30,000 people spent Rosh HaShanah by the gravesite of Rebbe Nachman in Uman. The sheer number of people dictates careful planning and foresight to cope with the unique medical challenges.Uman is located in the middle of a medical desert, with no medical facilities in the area. The closest hospital is 3 hours away in Kiev and even there, the medical care is greatly outdated. Because of the economic and political situation in Uman, there is no possibility to use local ambulances or even meager medical assistance. Last year the Uman Emergency Clinic dealt with approximently 2500 incidents, including a number of serious cases such as injuries, heart attacks and incidents related to diabetes and high blood pressure. Thus, a special emergency and first aid clinic in Uman for Rosh HaShanah is mandatory and an issue of pikuach nefesh. We are very dependant upon private funding for this critical service. We are in urgent need of funds to fully cover the expenses of the Uman Emergency Clinic. Total minimum expenses are $72,000, which covers salaries and airfares for medical personnel, all communications and medical equipment, hospital beds, medicines and the special ambulance with crew for 9 days. Your help is not only a matter of public health and safety, but a tremendous mitzvah. You'll have the rare merit and distinction to be counted as one of the "hosts" for this Rosh HaShanah 5775 in Uman, IY"H.
Many heartfelt thanks in advance and in the zechut of Rebbe Nachman of Breslev, may you and yours be blessed with a year of abundance, blessing, health, happiness and prosperity. special ambulance together with an intensive care unit staffed with a crew on call 24/7. 12 medical professionals including 6 doctors—expert in all fields, including first aid, trauma, psychiatry, children's health and internal medicine, flown in specially for 9 days.